Many in Bitcoin know how goal posts were continually shifted from one day to the next by the Core camp within Bitcoin. Their particular position was made prominent with the use of censorship as well as gas lighting. Everyone knew that hash rate makes the final decision as a dispute resolution mechanism. However the core camp were fully aware that most of the hash rate was indeed controlled by those in support of an alternative road map, a block size increase. So, what was the solution? The solution was to find any excuse to reason that hash rate doesn't decide on the matter. Again, with a *touch* of censorship as well as some social media presence as well as a pinch of mass media (isn't it funny that Adam Back was going on news shows speaking about Bitcoin's success?). When Bitcoin cash (BCH) forked away from Bitcoin core (BTC) in order to not taint the protocol with Segregated Witnesses (affectionately known as SegWit), the miners had a vote, they chose to not follow their short-term profitability incentives rather than rock the boat in order to achieve their long-term incentives. They chose this as the Bitcoin core (BTC) price rose faster than Bitcoin cash (BCH). And while supporting the most profitable coin over the short-term they sealed their fate that Bitcoin core (BTC) would have the most proof-of-work, and that scaling could not be achieved so that transaction fees will eventually be able to pay for their infrastructure. Just over a year down the line and we're in a situation where when Bitcoin / cryptocurrency had THE MOST ADOPTION in terms of capital being allocated towards the industry, yet it was likely allocated towards the dominate chain, Bitcoin core (BTC). A chain that can't scale and when any of these new users try and transact they will likely do so on full-blocks, a net loss for potential trade. Each portfolio that allocates capital likely allocates a decent chunk towards Bitcoin core (BTC) to the detriment of miners long-term interests. In summary, miners didn't vote for their long-term interests during the BTC / BCH fork. They are now in a limbo situation where the coin that grows it's adoption by the day (in terms of capital allocation, as it's the dominant coin) is set to fail down the road, as it's not peer-to-peer and will use intermediaries. 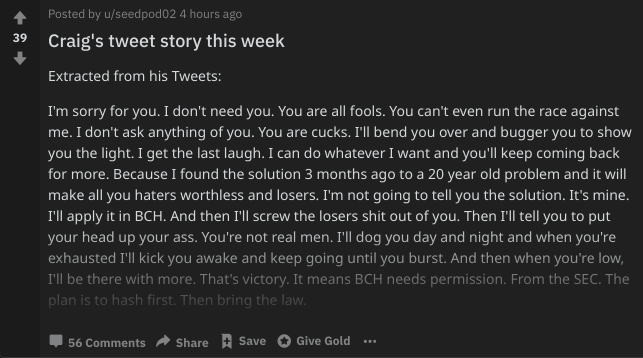 Everything was happy clappy in the Bitcoin cash community, we had went through 3x hard forks and were a cohesive unit. Leading into the 15th November 2018 fork however something seemed to have happened. ABC seemingly had, and still likely does have most of the community's support be it directly or indirectly. On top of that through this support network was also the direct or indirect support of the biggest miners in the industry. When SV was first mentioned, it was quite literally seen as joke by many. 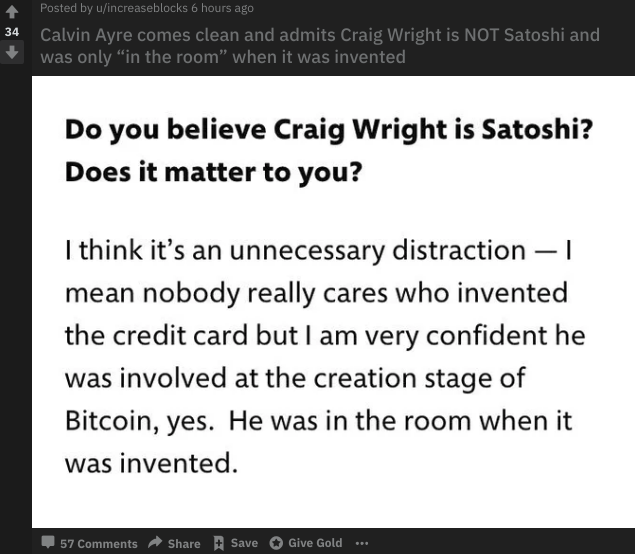 This probably comes from the fact that Craig Wright (or Mr Wanker as Rick Falkvinge calls him) doesn't have a good track record with releasing things on time, also, most likely because he's got poor social skills. When SV code was eventually released, again it was mocked as being a fork of the ABC code. 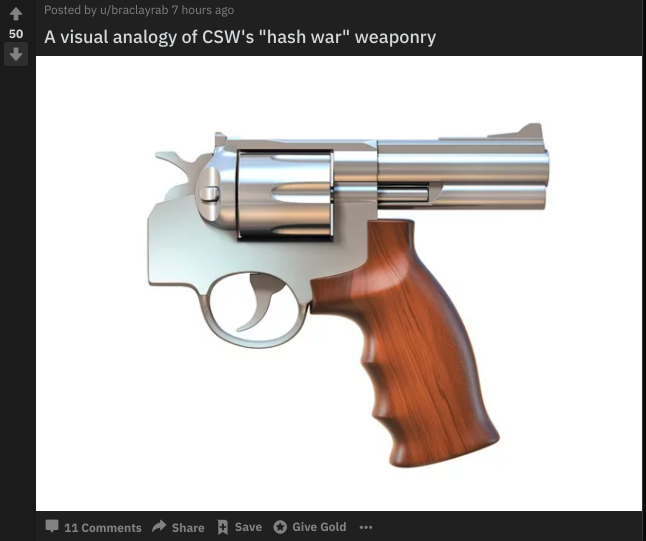 But everyone said "heck leave them be, they'll never get the miner support with that loony CSW and Calvin Ayre". 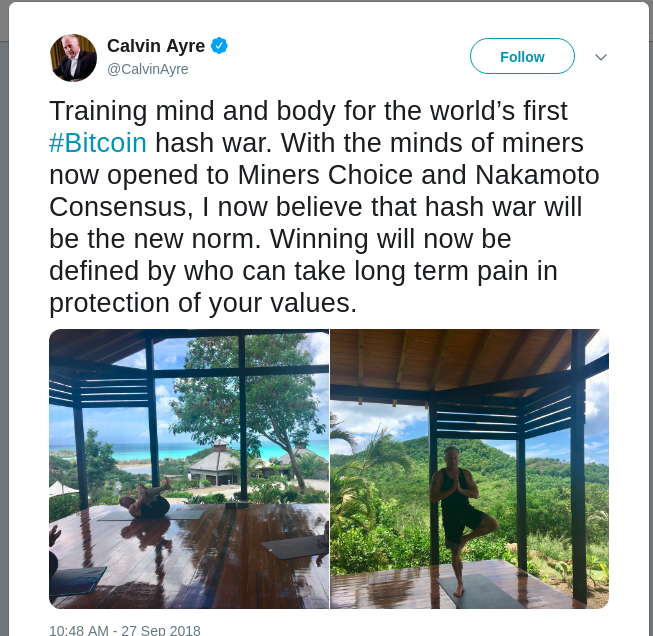 Does anyone remember seeing this post from Calvin Ayre? However there was an interesting turning point, and that was when SV began to gain hash rate. Whether or not the hash rate will stay is a different story. But what it showed was that when a road map (in this example ABC) came into question as miners began to decide on the direction of Bitcoin and as a result their underlying investments people weren't quite happy. But why? Is it because they perceive that ABC wouldn't get the hash rate support from those who believe in that particular road map? Is it because they don't like a particular individual? When we should be discussing the substance of the matter we're discussing an individual, and not even the individual's ideas, or that individuals drive to gain and mine at a loss in order to put in place Nakamoto Consensus. Although we had the blip in our history which is the fork of BTC / BCH, where miners that were 70% of the hash rate decided to choose the short-term profitability, rather than direct the network as they deem fit. We are in a position to say that the Bitcoin cash community respects miners decisions on where they vote. That miners are indeed the drivers behind the governance of Bitcoin and it's road map. If we are to not choose Nakamoto Consensus and begin to reinforce it year after year, decade after decade, we will find ourselves in a situation where those who are best at steering public opinion will win the fight. Think about it. Most of us have a decent understanding of Bitcoin, yet if we can't agree that the most hash rate should decide what is Bitcoin then what can other people agree on? 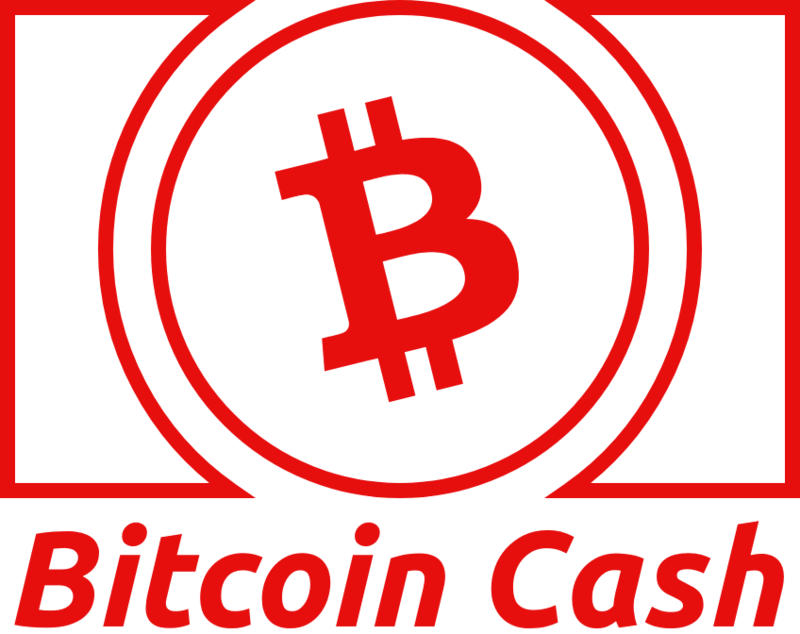 My personal opinion is that Bitcoin cash can still gain the majority of hash rate over the long-term, however if we fail to choose Nakamoto Consensus we're in a situation where we fragment in the future, over and over again. This fork is the second time miners really get to choose, we know what the outcome was in the past, it shouldn't happen again. This is being shown by SV miners who are mining on a less profitable chain in order to assert that miners choose the direction, with users, exchanges, and all other actors in mind. Whether ABC or SV or whoever else "wins" this hash battle, I think it would be wise from a long-term governance perspective to support the longest chain on Bitcoin cash. This is exactly what I needed to read after being gone for a while. It's absolutely hilarious how many negative votes this post got. Thank you. Exactly my view on this.